Advertising Online FAQ - Get your questions answered! Yes, I am interested in learning more about advertising on www.mrcoldcall.com! 1. Who is Mr. Cold Call™? "58 Sales Openers that will WOW your sales prospects!" "113 Common Sales Objections, 192 Clever and Savvy Responses"
We use Paypal (owned by eBay) to securely process our payments. If you have a paypal account you can use your username and password to log-in. You can also process the payment if you are not a Paypal member. Your credit card will be charged one-time for $59.95 (for one-year of advertising). Remember to click the “Return To Mr. Cold Call Inc.” button after you have submitted your online payment. 3. How many people visit Mrcoldcall.com? How long do they visit for? And finally, from where? Since 2003, Mrcoldcall.com has received more than 3,000,000 website hits. The average visitor spends from three to eight minutes per visit! Business Owners, C-Level Executives, Presidents, Vice Presidents, Directors of Marketing, Sales Managers, Inside Sales Representatives and Outside Sales Representatives. The Mr. Cold Call Online Network of Sites is viewed by people from around the world. Click here to learn more about MrColdCall.com! 4. Once I submit payment, what do you need from me? Once you have successfully submitted your payment online you will be brought to a page that details all link and advertising information. We will need you to send a short text link that should be no longer than 80 characters. The number of characters should include spaces. You can easily find this out by copying and pasting your link inside a blank word document. Click on tools and drop down to "Word Count." We also prefer that you send us 3 different versions of your text link so that our Advertising Department can select the best advertisement for our site. We will also need your company’s website address so that users can click directly to your site (you can also have your test link linked to a specific page on your company's website as well). Finally, if you would like to see specific examples of our advertisers then visit any page on Mrcoldcall.com and scroll to the bottom of the page (All text links are listed under "Featured Advertisers"). 5. What happens if I want to change the ad copy on my text link? 6. How long does my link need to be on your site to see results? Some advertisers may see results right away. Others, may see results in a two to six months. We have the traffic, it really depends a lot on the ad copy of your text link. The Mr. Cold Call Advertising Team can help you craft a message for the highest level of response. Also, in time, your link may appear in the natural online search listings such as Google, MSN or Yahoo. This usually takes about one to three months. Finally, advertising is about repetition and if you don't understand this basic marketing principle then you probably not the best candidate for our advertising program. 7. If I have a question about my advertising link, how long does it take for a response? You will receive a response within 24 hours by either phone or email. 8. If I have additional questions about this package and prefer to speak with someone on the phone, may I call? 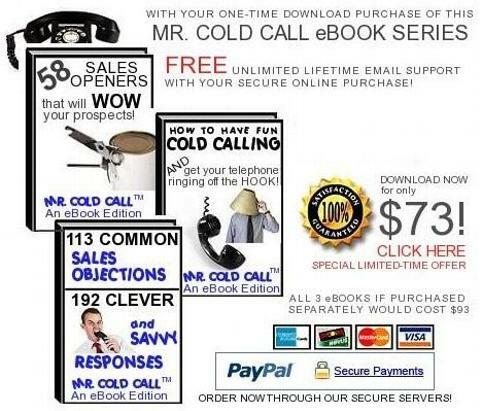 Sure, please email your phone number to advertising@mrcoldcall.com and you will receive a return call within 24 hours. 9. Is www.mrcoldcall.com a secure website to make an online purchase? Online payments are processed by Paypal our secure payment provider. Paypal uses SSL technology to guarantee a safe and secure shopping environment.